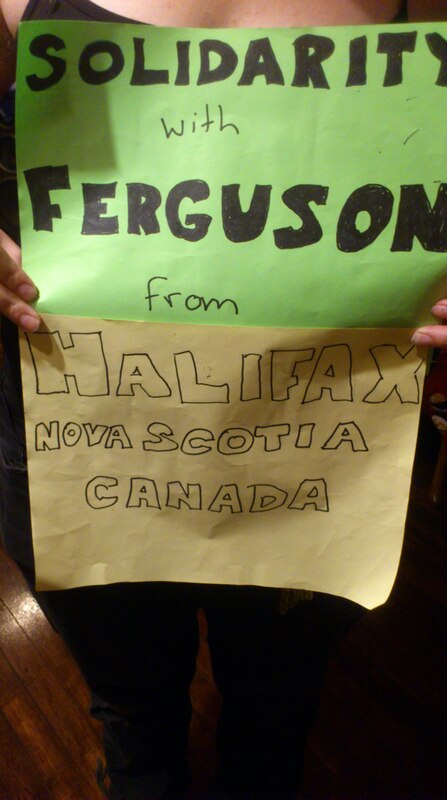 There’s a rally in Halifax this Tuesday in solidarity with the people of Ferguson, Missouri, and all black youth. If you’re a teacher, I’d like to encourage you to attend. I won’t re-hash here the details of Ferguson teenager Mike Brown’s killing by police officer Darren Wilson, or the subsequent wave of protest that showcased the militarization of U.S. police for the whole world to see. The rallies and demonstrations taking place around North America in response to this incident are reminders (for those of us who have the privilege occasionally to forget) of the centuries-old patterns of anti-black racism* that continue to plague our society. In the wake of Mike Brown’s death, more of us are learning statistics that illustrate this, like the fact that more than 300 black American men were killed by police in 2012, or that the median black family’s wealth is 1/20 that of the median white family. Here in Canada our conversations about race are more muted, probably due at least in part to our preferred national image as the place where enslaved African-Americans came for freedom – after fighting for the British in the Revolutionary War and the War of 1812, and on the Underground Railroad. The late 1980’s and early 1990’s saw very public incidents of flaring racial tensions, leading to reports such as the Stephen Lewis Report on Race Relations in Ontario (1992) and the BLAC Report on Education in Nova Scotia (1994). Both reports spelled out the details of anti-Black racism in their respective province’s institutions and made recommendations for change. These recommendations have been implemented to varying degrees over the past 20 years (the last comprehensive evaluation of the BLAC report’s recommendations was done in 2009; that report is available here (PDF)). As teachers, we need to recognize where our students are coming from. For our African Nova Scotian students, this means understanding that they live in a world where they are disproportionately suspended from school, put on special education plans, and incarcerated. We need to examine honestly the reasons for these inequities, listen to our students (as well as our colleagues and friends) when they tell us about incidents of racism, and do the hard work needed to address them. And we need to encourage and support our students when they take the lead in the fight. Let’s start by showing up on Tuesday. * This isn’t to say that other forms of racism are more or less important than anti-black racism; it’s simply to note that different forms of racism are qualitatively different from one another.